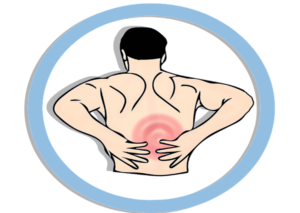 According to the American Council on Exercise, 60-80% of American adults suffer from lower back pain. Although sometimes the issue is related to an acute injury which could not be avoided, oftentimes the problem can be prevented. Lower back pain can be attributed to a host of issues including any or all of the following: carrying too much body fat, a sedentary lifestyle, weak core muscles, tight muscles, and/or poor lifting mechanics. Excessive bodyweight can place a strain on the muscles and ligaments that help support the spine, especially weight carried in the abdomen. In addition to this, those who are overweight tend to live a more sedentary life, which can lead to tight muscles, muscle imbalances, and weak core musculature. Sitting for long durations can lead to shortening of the psoas and hamstrings and weakening of the core muscles that are responsible for maintaining posture as well as supporting the spine. As a result gluteal muscles begin to atrophy and lengthen, forcing other muscles in the back to compensate. When a person lifts an object from the floor, tight hips force the individual to compensate by using the muscles of the lower back. The repeated use of the lumbar spine and muscles that support this area of the back can cause excessive wear and tear. At this point the individual may need more than stretching and strengthening exercises. Removing limitations of stability and mobility will not necessarily lead to a change in how a person has trained their body to pick up an object. They may require certain movement patterns to be reprogrammed. More specifically, this would involve retraining the body to hinge at the hips. For those more interested in preventing and/or addressing lower back issues please consult with any of our qualified fitness staff.